(January 28, 2019 – Toronto, ON) Organizers behind the 2019 Toronto Animation Arts Festival International (TAAFI) have announced the festival will host a screening for DreamWorks Animation’s feature film, How to Train Your Dragon: The Hidden World, with Canadian Director and Writer, Dean DeBlois and Canadian actor Jay Baruchel in attendance for a Q&A after the screening. Dean DeBlois is a Canadian born and raised filmmaker. He directed Lilo & Stitch and all three films in the Dragon trilogy including How to Train Your Dragon, and How to Train Your Dragon 2. He started his career working as an assistant animator and layout artist while attending college. He graduated from Sheridan College where he studied animation. Canadian actor, director and screenwriter Jay Baruchel is known for his roles in the Dragon franchise as the voice of Hiccup, but began his career in television prior to his role in the Oscar®-winning film Almost Famous. 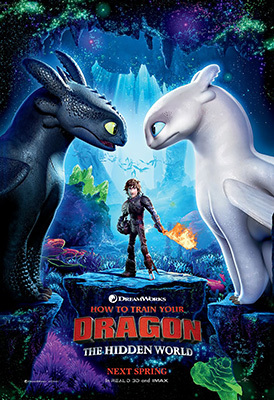 The How to Train Your Dragon: The Hidden World screening with take place on Saturday, February 16 at 7:15 PM at the Hot Docs Ted Rogers Cinema during the TAAFI 2019 Festival. This year festival-goers can see more than 100 animated shorts and four feature films from more than 50 countries worldwide. How to Train Your Dragon: The Hidden World opens in theatres in Canada on February 22. The TAAFI 2019 Festival runs from February 15 to 17, at the Hot Docs Ted Rogers Cinema, 506 Bloor St. West, Toronto. Founded in 2012, the Toronto Animation Arts Festival International is a not-for-profit arts organization whose mission is to make Toronto the premiere international destination for animated arts and entertainment.